Today we are going to give in this post, how to fix the mic problem in the hardware of Apple iPhone 5s by jumper way solution. In this type of problem you can hear the voice of others on call, While they aren’t able to hear you. Here in below you can see the image, That image says to fix the mic problem. Just you may have to do two Works of your phone hardware area, Then it will work. You should have to change a new four pin Mic of iPhone 5s phone and If the Method difficult or not work to you, please try our method. Our method is jumper way Mic creation. if you have more information, See the image below to make your own mic, It’s very easy for you. Remember: Usually the problem come on the Mic part. so, you only need to replace a new good Mic or Make a jumper way Mic the image shows and everything is resolved. 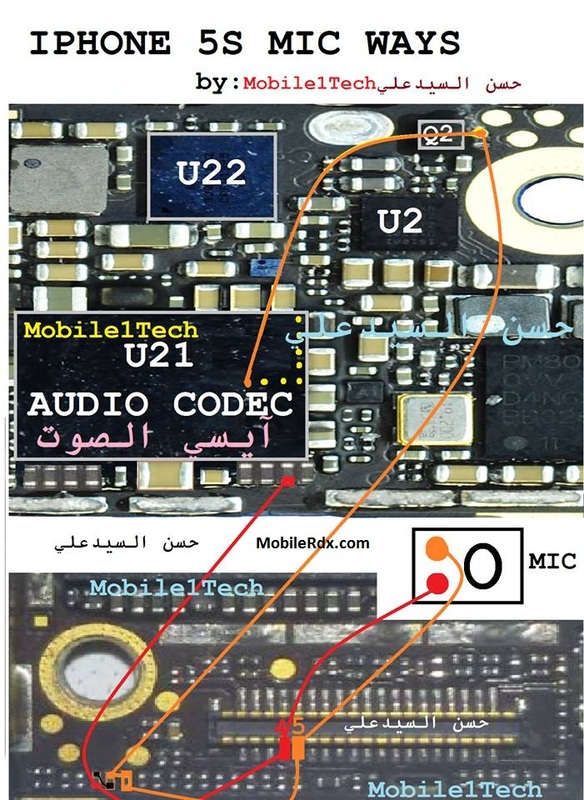 First, you have to remove the broken mic / problems that are still attached to the PCB iPhone 5s you could be separated using Blower / Solder, then you grab the mic china mobile phone and plug it directly to the Capacitor / Resistor Mic that we put a red color for line plus and black to track, please direct you to solder the capacitor / resistor do you plug in a mic directly as track plus a mic easily damaged / broken.